New ways to embrace relaxation every day! 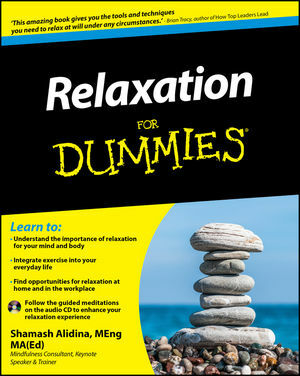 Relaxation For Dummies provides a straightforward guide to understanding the importance of relaxation in our readers' day-to-day lives. Covering a variety of simple relaxation techniques, including meditation, breathing techniques, hypnotherapy, guided imagery and yoga, this book shows readers how to use physical and emotional relaxation to combat a range of issues including stress, anxiety, phobias and fears. The book is accompanied by an audio CD that provides accompanying relaxation exercises for readers to follow. Shamash Alidina, MEng MA(Ed), is a professional mindfulness trainer, keynote speaker and stress management consultant. He specialises in mindfulness training and teacher training for therapists, coaches, executives and the general public. He has trained with Jon Kabat-Zinn, Thich Nhat Hanh and Matthieu Ricard, and at Bangor University's Centre for Mindfulness. He has over ten years of experience in teaching mindfulness. He currently runs mindfulness-based courses one-to-one and in groups in London, as well as via distance-learning. He is the author of Mindfulness For Dummies.